The Asolo Fugitive GTX has excellent ankle support and a rigid outsole for stability, but not so rigid you feel like you're walking on frostbitten feet. The lacing system is very adjustable for foot shape and individual tightness preference, and the laces are long enough for many alternative methods of lacing, but not too long for the traditional method. Hard to find wide widths! I need to start off with a short story. These boots saved me over $200 — my right foot is in pretty bad shape, with arthritis in the big toe due to breaking it on my third jump in army parachute school almost 30 years ago, and I had put a 50% deposit on a pair of custom orthotics (with a Morton Toe extension even though I don't have Morton Toe) to limit the range of motion and stop the bone-on-bone contact in the joint. Then I found these boots, and realized that I'd been wearing the wrong size boot for years. Thanks to the help from a very knowledgeable sales associate at a local Eastern Mountain Sports I found that most of the pain I'd been dealing with for years was due to fallen arches and improperly-fitted (too big) footwear, and between the Fugitive GTX and a pair of SuperFeet Carbon footbeds I can now walk all day and not be in near-constant pain. I canceled the order for the orthotics, and was able to use some of the money I saved for new gear. After about 6-8 weeks I decided they were just a tiny bit too tight across the toes at the end of the day and had to return them to EMS. REI ended up being the only place that had 11E, I've been wearing these every day since getting them and can't remember the last time my feet have felt so good all day long. I really love these boots. The fit is excellent and I can lace the ankle nice and tight without squeezing my toes. Take your time lacing these up and make sure your heel is fully seated in the heel cup, and these cradle your feet like they were custom made for you. Due to a recent knee injury I haven't been able to do much walking on uneven ground, but things are strengthening up nicely and before long I'll be using them for what they were meant for. They should also be excellent for snowshoeing early and late in the season when temps are moderate. The Gore-Tex lining will keep my feet dry and dry feet are warm feet. I haven't had the chance to really test out the waterproofing yet, but I don't think there are too many doubts about the efficacy of Gore-Tex. Everyone mentions that these boots look very good. I jokingly call them my bowling shoes because of the three different colors and their pattern, but I think they look great with the red accents. During my daily wear I didn't find a need for any breaking-in, other than leaving the laces slightly loose over the forefoot. Once or twice daily for the first few days I had to tighten the laces a bit, whether that's from the laces stretching or the boots conforming to my feet I'm not sure. Asolo has made a lifelong customer out of me, both for the fact that they're the only boots out of 5 or 6 different manufacturers I've tried that fit me properly, and because of their reputation. I especially recommend them if you have wide feet. On Saturday I wore these snowshoeing with some friends in Jackman, Maine, and am very happy with their performance. The uppers are substantial enough that I was able to securely tighten my MSR Lightning Ascent snowshoes without pinching my feet or cutting off circulation, and even though the leather was completely soaked through by the time we were done my feet were nice and dry the whole time, thanks to the Gore-Tex membrane. I can wear these all day long and my socks feel dry when I take them off. The temps were in the mid 30s. I'd estimate that with a polypro liner sock and good wool socks they'd be comfortable down to 20°F, maybe even 15°F. I REALLY wish these had a gaiter loop now; maybe I'll try to tie a small loop in the middle of the lace and double-lace the bottom eyelets to keep it from pulling on them or tightening them. Yesterday I climbed Mt Washington, N.H., with some friends and acquaintances (I didn't make it to the summit) and wore my Fugitives. I'd debated wearing a newer pair of a different brand of Vibram-soled boots instead, but they're not as comfy and soft as my Asolos and that ended up being the deciding factor. These boots ROCK! This is the first time I've worn them on really demanding terrain, and the soles stick like you wouldn't believe. Wet rocks or dry rocks, I never had a moment of doubt when transferring my weight onto my leading foot and off the trailing foot and trekking poles. I can count on the fingers of one hand the times my boots slipped, and it was always due to poor foot placement on my part. Wet or icy rocks, muddy boot soles, nothing could make them slip if I did my part. The outsoles are rigid enough that there's no flex when stepping onto a knife edge rock under the arch, yet they do allow enough flex to lever yourself upward by the toes. The laces stayed tight the whole time (I did remove them twice when I thought a sock might be bunching up), and at the end of a brutal 6 miles I had no blisters or even hot spots. Ankle support was superb, it was very uncommon to be able to place your lead foot perfectly in line with your direction of travel but never once were my ankles stressed. There really wasn't any water to speak of on the trails, a few spots with 1-2" deep mud and meltwater trickles running down the rocks, so the waterproofing never got tested. Previous use has shown them to keep my feet completely dry, and when I got home early this morning my socks were dry even though they'd gotten slightly damp with sweat yesterday. Body heat and the breathable Gore-Tex membrane are all it took to let them dry. I love these boots, and just wish they came in wide widths in other colors because I'd buy one of each. I'll recommend these to anyone looking for good hiking boots. I'm glad you found a pair of properly fitted boots that helped so much with your feet, Phil. I hope you'll let us know how they hold up, especially over your winter use. As a man with arthritis in both knees, I feel you pain, and I was thrilled to find my own set up that keeps me moving. Thanks for the review, Phil! Sorry you didn't make the summit, but hope it was a good hike, Phil. Thanks for the update. It was a GREAT hike and I'm glad I went. I hope to do Chocorua in the next few weeks with one of the guys from Mt Washington. Something a little more in line with my current abilities LOL. Chocorua should be a good one too—very nice views. I actually have some old pictures of my grandmother and her brothers climbing it 80-90 years ago. Those would be cool to see! 30 years ago we climbed it several times a year in Scouts, I think we took Piper trail, whichever one starts on route 16. And hit the Pizza Barn in the way home every time. The only boots I will ever purchase. After prolonged use, the fabric where the top bends begins to wear; waterproofing then gives out. The insole it comes with is insufficient for serious use. Fit: They fit a little tight for their size. I would go up at least half a size to leave room for swelling. Support: Ankle support was wonderful. Exactly what I expect from this height of an ankle. Water Resistance: Worked for a long time. Eventually the waterproof Goretex gave out, but I put them through hell. Traction: I never really had any issues with traction on these. The Vibram soles are wonderful. Temp Control: I used in winter and desert conditions. I feel they breathe just fine. Construction & Durability: Hands down the most durable soles on any boot I have used. The body of the boots hold up for a very long time. Grommets have bent and broken over the years, but I would say that is consistent with the amount of stress I have put them through. Conditions: You name it. I have been there or somewhere similar with these boots. They performed impeccably. First pair I bought were when I was 15. Used them in backpacking trips through the Rockies. The next pair deployed with me to Iraq and Africa for countless miles, then came along on a backpacking trip through Europe. I purchased another pair to take on 18 various trips across the world to extreme and austere locations. Jungles, deserts, mountains, swamps...you name it. These boots held up to the test of time, and terrible conditions. I hike with them, hunt with them, work and play in them. 10/10 will buy again. That is some serious use, Grady! Thanks for sharing your experiences with these Asolos. I'd love to see some pictures of your pair(s) in your review, if you're willing to add them. Thanks! Ever had a piece of gear that you lusted over for a long time, but had to wait to get? The Asolo Fugitive GTX was mine! We have a lot of cool to cold weather here, and a 2+ season boot thus had to be my first choice (see Asolo Power Matic 200 review). The Fugitive is also a great boot, but it is sometimes misunderstood, in the north country. 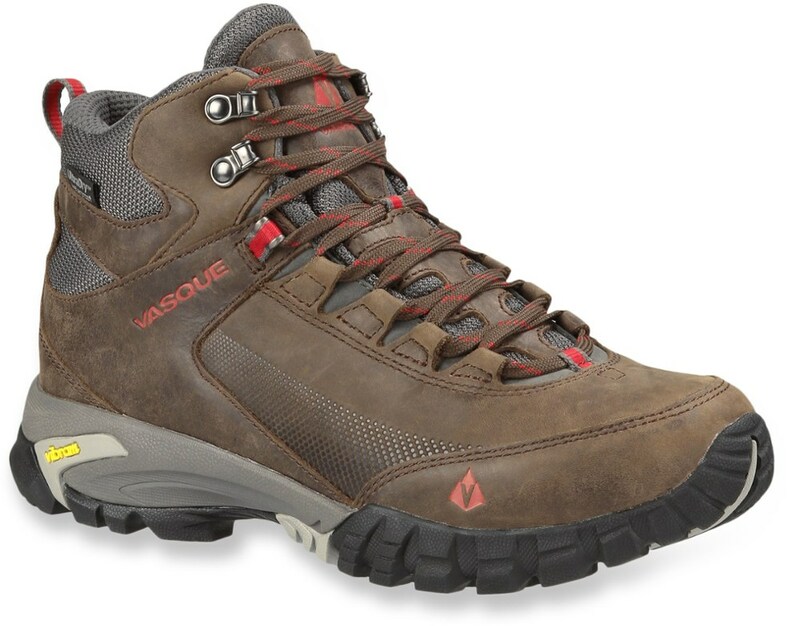 Would Fugitive be my number one year round "go-to" hiking boot. NOPE, not in cold weather. But when it is hot-warm-cool the Fugitive is a great kick about hiker, for sunny weather or rain over 50°F. Now those are some pretty snazzy looking boots! And more importantly they hike great too! They are wonderful for certain purposes. However, they are not designed for heavy pack hiking, especially in cold/cool weather. 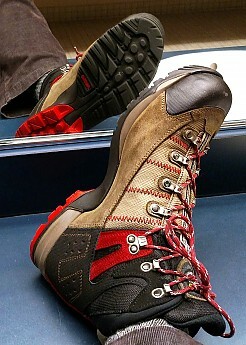 Asolo Fugitive GTX is my preferred "summer hiker" in PNW. With my piggy bank broke on the Asolo Power Matic 200 GV (see review) I first tried to use it on everything year round. Admittedly it was too hot June, Jul,y, and August in many of even our Pacific Northwest locations. Full foot sweatout, changing soaks at lunch on day hikes, was the consequence. Seems like every where I went I saw some guy wearing one! Even on summer vacations out of town, pairs walked/hiked past me. Totally maddening! Then at a big Seattle REI summer garage sale with more used boots then I ever have seen in my life, I saw a very few Fugitive pairs. However, none were in my "Big Foot" size 12 dimensions! Outwitted once again by the size 11's in my hands, a guy walked up and said "Sir those are FABULOUS boots! This is my third tour in Afghanistan and when they let us wear what we want, this is all that I and most of my friends want. Maybe 30% of all of troops boots in Afghanistan are Fugitives!" I told him these were the wrong size, and asked him his size. Ten minutes later, I found a newish pair in his size. Handing them to him and thanking him for his service, he looked surprised. Then, smiling ear to ear, went off to buy them. Part of me was happy for him, the rest had some insult adding to my injury. Piggy bank still low, I tried eBay and scored some for half price! They came and the length was right but it was too wide. Turns out that few folks know that Asolo marks its Wide boots on the main label at the front top of the collar as "WIDE" (next line on this folded tag in the photo is) "Fugitive GTX". Medium widths that run narrow actually, just say "Fugitive GTX". The inside label printed inside the both boots just says "12 (US)". I sold the 12's to my co-worker's husband for his construction work, and also watched him walk out smiling (again some insult to my injury). 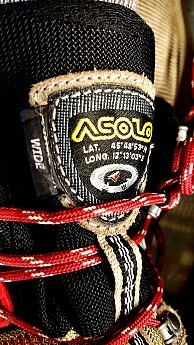 How to tell width on an Asolo boot. The inside printed label will just say "12 (US)" of either width. The top collar Asolo label will add the word WIDE to its wide boot (which runs more like a MEDIUM or MEDIUM/WIDE width). Their standard MEDIUM runs more NARROW/MEDIUM for most U.S. men (perfect for me!). Soon afterwards ... I lucked out again and found a "12" on eBay from a trusted seller. I made that poor guy run home and photograph the front label again, so I knew I could bid on the right one. I paid $15 MORE ... but the injury got easier because they were finally in hand. This boot needed some surface washing. Sports Wash and a vegetable brush in cold tap water worked great. I then used Nikwax Nubuk & Suede Proof (see review here on Trailspace) to make sure the boot was well waterproofed and to help shed future trail grime and dust. Water just beads up and does not soak into Nikwax Nubuk & Suede Proof treated boots. It did this before treatment, but the effect was enhanced by treatment. The surface of this thing hates getting wet (more boot shown)! So what's the rest of my boot use strategy? (Be looking for reviews or comments to reviews by others on the below boots). Asolo Power Matic 200 GV is my preferred winter cold/cool hiker (2-3 seasons trails/mountain PNW Cascades) and I have a similar earlier Asolo Power Matic 100 Nubuck/Suede as a backup. Oboz Firebrand II is so far my preferred 1-3 season light less elevated trail hiker (unless there's a lot of big rocks to get through). I'm also testing a used Asolo Agent GV for this (important review coming soon on it). I like the feel of Asolo after hikes too. I picked up a pair at REI Garage sale with thought of using them for summer boot with more leather protection (they are non-Gore Tex and cooler). Breaking them in now for several months I like them so well that I go to work in them and also try to wear them there, except when I interview people, and then I use Timberland Oxfords and Wingtips (waterproof with nice hiking tread feel). Let me know what you'd like reviews on and if I have enough experience with them, I'll put in an opinion review. Yes, I think of it as a nice summer boot! To extend seasons, carry more weight, or snow activities, try the Asolo 520 GV. It comes in a wide too. The Asolo Power Matic 200 GV might also come in a wide. I see two of my hiking friends out here with wide feet wearing the 520s and loving them. One is a Meetup hike leader with several hundred people listed in his group (I doubt more than 30-40 are very active). On weekends here, at 7:00 to 8:30 AM, as we meet at Park 'n Rides, it is a great time to compare boots and other gear impressions with others. I certainly see Fugitives (boots) among them. We just must be sure to jump into the correct carpool for the day hike expected. With 2 or more other groups potentially meeting at the same time, every so often someone, still distracted about boots gone bad/good stories, finds themselves on the way to the wrong mountain, coast, forest, or wetlands etc ... they then typically just go with it! The nose rubber, that black piece you see up front, started to get serious cracks. In my book a definite material malfunction. Never again, Asolo, and hopefully never again anything vulcanized. I would spend a ton of time reading any reviews you can get your hand on before deciding what shoes to buy. You have only one pair of feet and abusing them with bad shoes, but with lovely treks, is not worth any price. Rubber nose protector is cracking after a little over 2 years. I bought mine in November 2013 in Pto. Natales, Chile—after I couldn't find any good mountain boots in Pto. Montt. These ones were the only one that fit my feet reasonably—later found out a wide version existed too, but wasn't available in that town, and had looked like they had a reasonable sole, upper connection. I hate vulcanized boots, but out there I had no choice for double stitched boots. Anyway the hiking was good, broken in quickly and of course light... no blisters or extreme sore feet after a full hard day hike and some serious climbing in the park near Fitzroy mountain in Patagonia, Argentina. But now back in the tropics I noticed that the nose rubber, that black piece you see up front, started to get serious cracks. In my book a definite material malfunction, so I contacted the headquarters in Italy. They are willing to repair for $50, but shipping back and forth is also my cost. Forget it. I get the same nose rubber it is gone in two years again, and shipping and handling will be like ordering new boots. My next shoes are going to be full upper leather and double stitched. I used to have a pair in the '80s which lasted me ages... why oh why did I toss them? If you read that some of the all leather double stitched owners have boots for 5, 10, 20 or even longer years. These new vulcanized are not cheap either. Lighter yes, but you learn to walk with the weight especially if they are super comfortable. The reputation of #Asolo is gone to the moon all I care. If you read the serious reviews on the Internet as well as those on Amazon, Asolo has more problems and their service is failing in my opinion. No more of this rubbish for me. After very limited use and two years in the tropics, the soles of both shoes just fell off the boots. Useless rubbish... My next boots will be Norwegian stitched mountain, or hiking boots. Yes, they're heavy, but you can learn to walk with them and your feet and your wallet will love them. I now have secondhand—almost new—Lowa double stitched leather boots and am happy as a child with great quality. Never again these vulcanized junk any more. My humble opinion: Do not buy these vulcanized shoes garbage. Welcome to Trailspace, Eric. Thanks for reviewing your Asolos and sharing your experience with them. Thanks for the update, Eric. Good luck finding new boots. I came here to offer the same review on these boots. 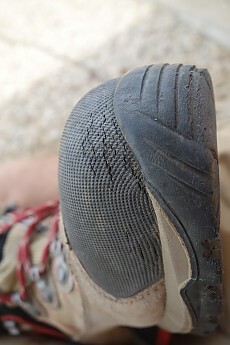 I also experienced the initial cracking and then one day on a long hike the soles simply disintegrated. It was amazing. Hi Rich, I hope you'll considering writing your own review of these boots to share your experience. Eric, I hope you'll share a review of your new boots once you've had time to adequately test them out. I'm fairly satisfied with these boots. I appreciate the good foot and ankle support during strenuous hiking. I've worn them in snow with gators and they've performed well. With the addition of custom insoles and preparing them for water, the boots have become part of my foot when worn. I recommend buying them. Fit: I wear 11 and a half and I find these shoes to provide good foot, heal, and ankle support. I wear them with a custom insole so I've tailored arch support, but I am also somebody who always benefits from additional arch support. Even as a heavier boot, however, with the right customized support the boot essentially becomes part of my foot when properly laced. Maybe the best pair of boots I've owned. Comfort: The stiff sole on this boot makes break-in a different kind of process. The boot has maintained it's basic factory structure since purchase almost a year and a half ago, which I like. Comfort level is largely dependent on properly lacing to fit. Support: I find the ankle support to be fairly good. I am certain this boot has saved me from injury where other boots would have failed in so far as the support it provided has been just enough to avert twists and sprains when I've lost footing while carrying a heavy load. Water Resistance: I've found them to be fairly water resistance. I have not tried leaving my foot submerged for extended periods of time to really test this, but I've done a fair amount of hiking in snow using them with and without snowshoes as well as some creek crossing. In snow, with or without gators, I've never had a problem. The same with creek crossing. However, I've also kept the shoes prepped with waxed to seal them from water. So what I can say is that if you buy these shoes and prep them, they are great. Traction: Reasonably good traction considering the stiff sole design. Temp Control: The shoes breathe fairly well though are not magic. On long hikes, you will still need to take off your boots and socks and air your feet out periodically. Ease of use: Sort of comes with the territory with hiking boots, but I often have to tie and re-tie these boots multiple times to create the right form-fitting dynamics with these boots. Part of the tradeoff with the stiffness that provides the support, I suppose. Construction and durability: I have found these boots to be durable and well put-together, though I've heard reports that they've come apart for others. Conditions: I've used these boots primarily for hiking. Their stiff sole design and high cost has encouraged me to use these boots only when needed for strenuous hiking. I've put in perhaps 100 hours of actual hiking time on the boots and the treads are reasonably worn but things are still great overall. I've had the boots for around five weeks now. They are very tough and super comfy. Just what you look for in a good peice of footwear. I have worn these boots almost every day since buying them. Cruising the streets of Edinburgh, walking the beaches and hiking around the trails, on my visit to scotland. The boots handled everything with ease and comfort. The only problem I am having is with the laces breaking. I'm on my fourth pair. That works out about one pair a week. I'm not sure but, I would say it is in the eyelet lacing design. They are metal eyelets and i think, as you walk and move in the boot. The lace grinds on the eyelets and frays. This problem could be solved if there was a good tough fiber lace that would not come apart as you walk in the boots. This minor problem solved, and you have the five star boot. Now looking for kevlar laces. I bought these boots in the days when I used full-on heavy hiking boots for regular hiking (I've since joined the masses in using lighter weight footwear on the trail). These are exceptionally uncomfortable on my feet, and actually have caused me significant foot pain. However I have still found a use for them - they seem to work well for me when outdoors in cold and snowy conditions such as snow shoeing. They are relatively warm, and on snowshoes I don't experience the foot pain I felt using these on bare trails. I think I've had these boots for almost 2 years. I've used them on terrain ranging from beach sand, to parts of the Grand Canyon, to scrambling over rocks in the Sierra. What I like about these boots is that they are very rugged. I get the feeling they'll last me 20 years even with regular use. Well, at least the uppers are very solid. The sole looks like it's showing some signs of wear corresponding to the amount of use they've gotten. I also like that my feet sweat relatively little with these boots, compared to "heavy" leather boots I've had in the past. What I dislike about the boots is that they're very uncomfortable. They also don't grip as well as I'd like on rock or snowy surfaces. They also have a very "hard step". After hiking 5 or 6 miles my feet get very tired in these boots. They are a stark contrast to my previous boots, a pair of Merrells, which didn't last as well as I'd like, but which were very comfortable and had an excellent grip on all surfaces. Worst of all, I've had the issue described by others here, where a part of the upper jabs part of my ankle, which becomes very sore, especially on longer hikes or consecutive days of hiking. I'm not sure if it's the tongue as others mentioned, but at various points on my hikes, different parts of the upper have pressed on different parts of my ankle. 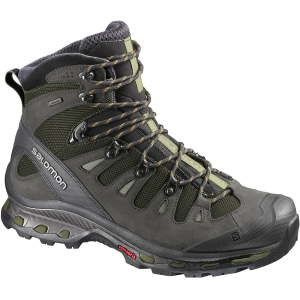 I hope to find a boot with the sturdiness and support of the Asolo Fugitive GTX, but with the comfort of my old Merrells. Good boots, if they both worked. Used these on an Appalachian thru hike and hiked for days in the rain. One boot leaked and the other stayed dry! I put 650 miles on them before they started to show real signs of needing to be replaced. If not for the leak I would recommend them. Buy them from REI so you can return them if they fail. Thanks for letting us know how these Asolos worked out for you, John. Left me walking in my socks, on rocks. Asolo Fugitive GTX hiking boots will fall apart, and leave you walking in your socks. Had to use crutches for a month after hike, dangerous boots! Welcome to Trailspace, Mel. Too bad about your boots falling apart. What happened? And did you get any assistance from Asolo? My soles came unglued and separated after just one month. I'm currently being grilled by customer service while attempting to get them replaced. I recommend anyone think twice before buying these. I paid 250 bucks for what I thought was a great pair of boots and now they'd like me to sit out the season for 4-6 weeks while I send them back to assess whether or not they will be replaced. I'm beyond aggravated. Oh, and if you shop at EMS I'd also suggest you go elsewhere because they refused to take them back. Welcome to Trailspace, Mike. Too bad about the issue with the soles. Good luck getting it resolved. Do you have any pictures of the boots and how they failed that you can show others in your review? That would be helpful to see. After eight years of wearing these boots, still kicking with them. They are great for any terrain from snow to plain woods. The shoelace—that's the only problem. They wear out so quickly, but just buy some BlueWater 3MM X 50FT Red Niteline at Amazon and they're good to go. From NY upstate to the fjords of Norway these boots have proven superiority on all kinds of lands and terrain. They feel so comfortable on your foot that I even wear them outside just for a walk. The support is great. If you're one of those people who loves to walk and walk, this is your boot. I can say much, but you must try for yourself. If you cannot find these ones, try also the Mustang GV. Rivet pulled out of lace retainer on the first time out! I understand manufacturing defects but the manufacturer refused a warranty claim as they were a gift and I had no receipt!! Thank god REI stands by its sales. Over complicated lace retainer. Hinged, why?? Poor customer service and build quality. Buy Keens instead! That's disappointing, Douglas. Care to share a picture of the defect in your review for others to see? If you are in the market for a great pair of boots these are great. I would recommend these boots to anyone who wants a good quality boot that will last for years. The Asolo Fugitive GTX is a great pair of hiking boots. I have gone through a lot of hiking shoes and boots and these have outlasted all of them. These boots are comfortable if you are carrying a heavy load or if you are just out on a day hike. The Gore-Tex on these boots have kept my feet dry while crossing streams, in the snow, even when it rained hard two days straight while backpacking (everyone else in my group got wet feet). I have owned a pair for five years and and put many miles on them both on the trail and off, and they are still going strong. The stability of this Class-A boot is superior amongst its competitors. Not only does the boot operate well on or off the trail, but it's also very stylish and comfortable. Tread doesn't seem to be very thick, which may not be all that of a con. Could just see it wearing down sooner. Breathability is minimal, but could be due to thick socks worn. The comfort and fit of this boot is spot-on. It stayed true to size (sneaker or other footwear). I contemplated going a .5 size bigger for thicker socks, but I'm glad I decided against it. Only used it for winter hikes so far and has been holding up well. 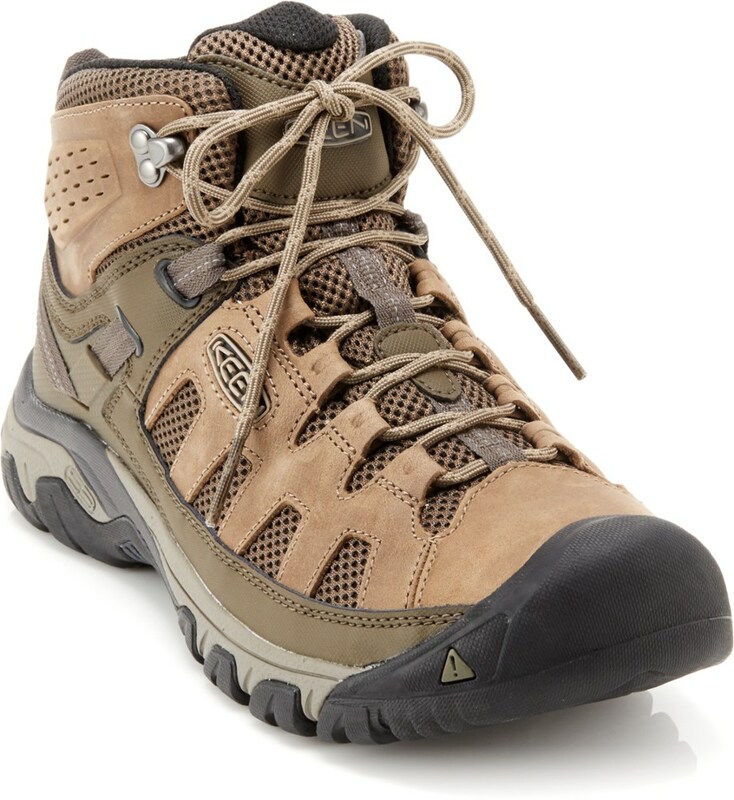 Also a great boot for off the trail walking/hiking. I would highly recommend this boot. This boot does have excellent support at the ankle and underfoot. 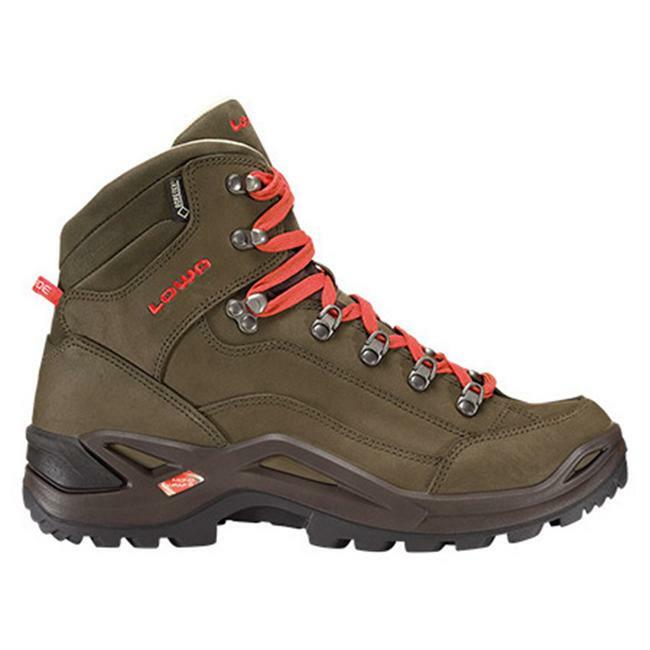 Great backpacking, rough trail or off trail boot. From serving in the military to extensive backpacking and hunting trips, the Asolo Fugitive GTX delivers stability, comfort and reliability that is increasingly hard to find in one single boot. Asolo delivers once again! 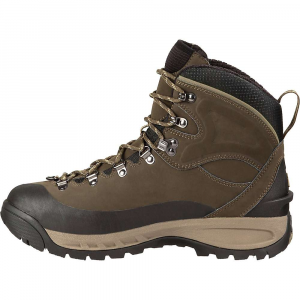 My first experience with the Asolo Fugitive GTX was while serving overseas in the military. I wore these boots daily and I quickly noticed how easy they were to break in compared to other styles and brands that I had previously worn. From rocky terrain to city streets, the boots were reliable day in and day out. The GORE-TEX lining is one of the nicest features of the boot. While hunting and backpacking I am never afraid to cross a creek. I am on my second pair because I loved my first ones so much! You will not be disappointed in these boots. I can say from brutal use, abuse and experience Asolo hit the nail on the head with these!!! They represent: The Good, The Bad, and The Ugly all wrapped up in one. The Good: Basic shoe looks good, fits great, and has nice attention to details. The Bad: Dependability in tough conditions. The Ugly: Customer help/service is near hostile. 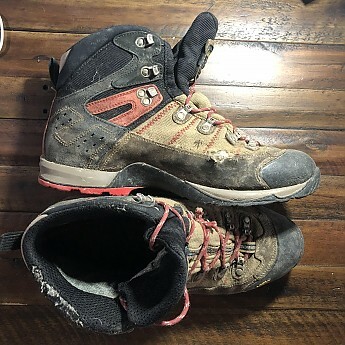 I have owed seven pair of Asolo boots, I hike them until they are well past their prime then I wear them daily at the construction sites I manage till the end of their usefulness. They fit my foot better than any other boot I have tried and I basically feel they are a great shoes; but on 2 pair out of the 7 pairs of boots I have owned the soles have separated from the main body of the shoe early in their life. I repaired the first failure myself and accepted it as "once in a life time event" then my 1-year-old Fugitive GTX failed the same way. Both soles separated within 3 miles of each other when I was 10 miles out and near 2 miles up. I now feel that after many years of a GOOD relationship I can no longer trust these boots when I head into places where I seriously need to depend on them and I can't carry a spare pair. My confidence in their dependability has been shaken and my faith in the company caring about a customer is crushed. I love these boots but have had bad experiences with blisters. I'm not a guy that gets blisters and have had three major blisters from these boots. I love these boots but have had bad experiences with blisters. I'm not a guy that gets blisters and have had three major blisters from these boots. Up to the point when the blisters happen I am super happy with the support, traction and stability these boots provide. I just wish the blisters didn't show up. I'm a flatlander that likes climbing 14'ers whenever I can. I am six feet tall and around 235 lbs (bigger than an average sixth grader). I am normally a size 13 but went to size 14 for these because of the narrow fit. When I lock my foot in while lacing I still feel my heel moving even though everything else feels snug. Forward of the heel it is right for my feet and supports very well. Break-in time seems to be longer than any other boot I've had. They are waterproof and the top of the boot seals to keep crap out. The heel seems large, in comparison to the forefoot, and my only real issue is with the heel. Under a load these boots are very solid and supportive. I have carried 40+ lbs packs for multiple days without a support issue. The quality is top notch with zero visible popped seams of tearing after 3 years of use. Other than the heel these boots have done what I've needed without complaint. Summary: Solid boot but ensure the boot fits well from heel to toe and give yourself enough time to break them in properly. Decent boots with a few flaws that prevent me from recommending them for multi-day backpacking trips. Recommended for early Spring/ late Fall use, or short mileage trips. You'll notice I used the word "relatively" frequently in my "pros" list. 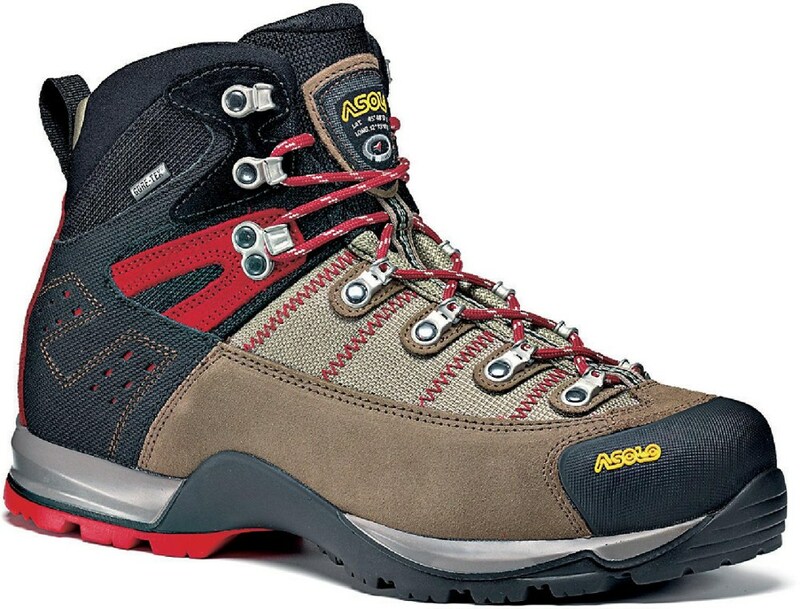 That is because compared to full grain leather boots, the Asolo Fugitive GTX's are light, breathable, and comfortable. In the beginning I wore these on multiple trips, covering multiple days and distances, and was well satisfied. Initially the only gripe I had was the traction. I had to be extra careful with foot placement as I found myself slipping more than normal. But I was happy with the comfort and breathability. I didn't suffer from sweaty feet or foot fatigue as bad as my hiking partners did with their heavier full grain leather boots. The Asolo Fugitives were initially waterproof as well, running the gauntlet on the Olympic Coast in 4 days of pouring rain, and passing with flying colors. On a weekend trip in northern Idaho everything changed. Trying to beat the sunset on a 15 mile day, my feet began hurting, and hurting, and hurting. The pain in my feet rocketed as the miles passed, and my hike became an exercise in pain and misery. It only happened once, but it was enough. I never took these boots on a backpacking trip again. I decided to only wear them day hiking in late winter and early Spring, where I might encounter snow, mud, and generally sloppy conditions on the trail, and that worked okay. Keeping under 10 miles I didn't have the foot pain as before, but I did notice that water now leaked into the boots. I coated the boots with a waterproofing wax, but it did no good. I guessed the water must be leaking in from a seam or hole in the stitching. Either way, I finally took them back, and have now given up boots all together. The Asolo Fugitive GTX boots lasted me 2 years of moderate-to-heavy use before they quit performing the way they were supposed to, and for the price I paid, that wasn't nearly long enough. In the beginning they were great, but as my activity levels increased, the performance of the boot decreased. I would not buy these again, or recommend someone else buy them either. After a few weeks the boots started wear out — very disappointing! First it was the tread (compound is way too soft). Then the stitching split. When I contacted Asolo they offered to resole for 40 euros if I sent them to Italy. Warranty??? I kept them for longer whilst arguing with Asolo about getting a replacement then both boots started leaking (after 4 months). Now Asolo were very happy to help, as it was the Gore-tex guarantee that was in effect. Poor quality boots, awful customer service. I have had these boots for a little over 2 years. I have had these boots for a little over 2 years. I am 200 lbs and typically backpack with no more than 30 lbs. I have gone on ~20 backpack trips (usually 2-3 days) and occasionally use them for work but they have by no means been abused/over used. Pros: comfortable out of the box, remains upper rigidity, fairly breathable, waterproof within reasonable limits, well fit for my slightly narrow feet. Price Paid: 3 years ago ?? As a woman, I have always preferred men's hiking boots and the ASOLO Fugitive GTX have been my favorite boots over the past three years. They are versatile, and have provided great traction in the back-country. No ankles rolling with the high ankle support, ease of lacing, and superior ability to adjust laces quickly on the fly. When I first purchased these boots, I only had a mere month to try and break them in for a four day trek in the Tetons. Happy to report absolutely no blisters, no soreness and no moleskin needed with a pair of silk socks under a pair of woolies. The have been a gem since, but I was the unfortunate buyer of a pair three years ago with the bad glue batch. After some email conversations with ASOLO (asolo@asolo.com) on my predicament of heading to Guatemala next month with one boot tip coming undone, I am sold on the company. Received a brand new pair in replacement of my old pair in the mail today, and I am sure a few days of breaking in will keep my feet happy, blister-free and moving onto more beautiful pastures. Absolutely recommend ASOLO as your go-to boot company. Thanks ASOLO! I have owned about 5 pairs of these guys over the last 6 years and love them to death. They are an ATV for my foot. I am a certified arborist and have climbed all over the country in all types of conditions from the southeast to the pacific northwest. I put these boots through the test every day on average of climbing 10 trees a day around 100 ft each. When i'm not in the trees i'm hiking all over! My loads range from light day hiking to 80liter 60lb packs with many miles put on the boots. The bark on the douglas firs and spruce trees are relentless and sap covered. The only issue that i have had is the gore sock breaking down right where the boot creases as you step forward over extended use. but that should be expected with the amount of work these boots get. the tread stands up very well as i am on all surfaces including a good deal of cement and black top. I have a narrow foot and these seem to be the best boots I have found. Everyone's feet are different, get to an outdoor store and try them all on.. walk around the store for a bit and test a few out. Also to shorten break-in time wet your socks and feet with hot water and crank your new boots tight and go do some yard work for a few hours... they will mold to your feet like a glove.. cheers and happy gear hunting! Use: Heavy treks, snow, heavy loads. I weigh 240 lbs and am 6'0" tall. I wear a size 11 Wide. We go hiking once a month and on a normal hike, we will trek between 10 and 20 miles with a 20 to 30lb sack. I tell you this because I have read a lot about people on here who are smaller or have narrow feet and I wanted to represent the other end of the spectrum properly. I bought these shoes 2 winters ago and they have been the best shoes I have ever owned. In the winter, I never leave home without these boots. I live in the DC area and during our blizzards last year, I wore these out every day and I can say they are 100% waterproof. I was worried that the salt, snow, and chemicals would degrade the glue as I have also read that the soles come away over time. I will say that this is not the case at all. I inspected them before my recent trek up Old Rag Mt and they still look brand new, same as the soles. I also wore these on a hike through the Atlas Mountains in Northern Africa that we took in the spring. Again, these shoes held up spectacularly. I know that Asolo had a bad batch of glue 3 years ago but they made good on exchanging them for people. To be honest, I have had one problem though. I need new laces now and I can't find any to match the original red ones. This was by far the most comfortable pair I tried on at the San Francisco REI store. I fell in love with it almost instantly, and could not wait to take it on a trip. But alas, after 20 miles of dirt, streams, rocks and snow, the soles on the tips of both boots started coming off. The trip obviously had to be cut short. I was, however, assured that this was a unique construction defect. Pros: No break-in period, very comfortable. Cons: Durability is a huge issue. Just bought a pair of 8W Fugitives to replace a pair of 7.5W LLB Crestas whose sole lugs have worn down after 1-2 kmi of mountain hiking. Would have gotten another pair of Crestas but LLB, in their infinite corporate wisdom (idiocy? ), has reduced the width of their wide boot (~3/16") to the point where it can hardly be called "wide," and certainly didn't fit me anymore. Took the Fugitives out on a quick 6 mi. trial mountain hike and liked them a lot--hope I'll be saying that in a few years with a one or two thousand miles of mountain hiking miles on them. By the way, it was a freaky 93F+ day in May and my feet didn't get that wet, despite the GTX lining, although I wish they, and other boot makers, had non-GTX versions of their boots--I'd rather get my feet wet from rain than my sweat. Didn't rate this a 5 because of limited experience with it so far and because it's not non-GTX. My husband bought his first pair of this hiking boot about seven years ago. He broke his heal off and fractured his ankle in a construction fall and was in a walking cast and crutches for awhile. When we found these boots my husband still couldn't even walk on his foot. When he put these boots on he was actually able to walk without his boot cast or crutches. He has been sold on them ever since. In the last seven years we have only had to buy three pairs and he wears them every single day. They are extremely comfortable and light weight. Good for all types of terrain and conditions. Our only problem is they are very hard to find in Boise where we live so we now have to order them online. I'm not one who usually writes reviews, but I felt compelled after using these boots for the past 2 years. As a construction manager for a NYC high-rise, I'm constantly up and down stairs and on tough concrete floors. These boots are extremely comfortable and have held up to the rigors of a construction site. Much better than the traditional steel toed boots that I've worn in the past. Soles are fairly soft so I was initially worried about durability, but overall they have held up well with daily use. Great for getting around the city, plowing through slushy sidewalks, and good traction on ice. Boots are a little warm in the summer months but definitely better than any leather boots. After 1-1/2 years, sole cushioning started to wear down but inserts have brought boots back to life. i bought me a pair of asolo fugitive hiking boots and i wish the tread was vibram but there not. for 150.00 the sole sure last longer than a year real awsome boot, be even better if the sole lasted longer. I love this boot! I'm a land surveyor in Colorado and I wear them every day. I'm on my 3rd pair of Asolo Fugitive GTX and recommend them highly. I have a narrow foot and rotate the 3 pair regularly. Even the oldest pair still gives me great comfort. My feet are my business and I like the fit of the Fugitive best. Save your money!! I must say I love the last pair of Asolos that my dog destroyed so I did some research and decided on the Fugitive. They didn't break in like my last pair that were all leather, but that's understandable. I have worn them as much as possible around town and small treks for a solid 6 months, but never did any real hiking. I recently went camping for 5 days and only did a 2 mile hike and these things are coming apart!!! I treat them very well and am extremely disappointed in their construction. So much that I joined this site just to let others know. The toe is peeling off and the stitching on the side is coming apart. So disappointed I will probably be finding a different favorite brand. If you are doing a hike which does not require hiking boots as described in the 150 mile Greece hike then I have no idea why you'd spend $200 on a pair of boots. However if you're looking for a decent pair of hiking boots with a short break in time these are a good option. I put less than a 100 miles on them before ascending 1200 ft and had no problems what so ever. The only reason I didn't give them 5 stars is because they didn't carry me up. I have really narrow feet and my feet always slide to the front of the boot. This is an issue with any shoes I have ever owned. I like them with this issue because they are a narrow boot to start and have a smallish toe box. They are really comfortable and have great support around my ankles and no rocks protrude up into the bottoms of the foot beds, they also have great arch support. I used to hike 2-4 milers in running shoes and my toes were beat at the end. Now the Fugitives have allowed me to day hike 8-15 miles and see things that are beyond my back yard. My complaints are they really stretch out after they break in. The tops are a tough nylon, and the sides and bottoms are leather. They are not as waterproof as I would have liked for a $180 boot. The Gore-tex does not really breath well, they are also really HOT to wear. I now have to use some odd lacing patterns to keep my feet from really sliding to the front. The one big thing is the soles are really slippery. They are not bad on dry rocks and dirt/stones. But if it rains watch out. You'll skate from the top of hills to the bottom and you'll have to really watch your step. They are great boots to learn in. They are my second pair of boots since I was a kid. I will probably look for a different pair of boots the next time. They are a pretty good boot. I have had these boots for four years and I am still wearing them. 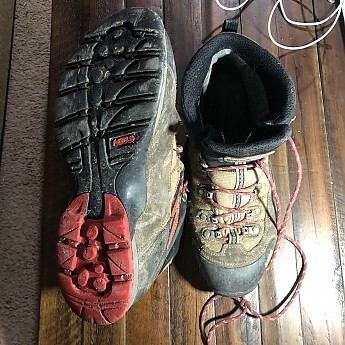 I have used them for multiple weekend backpack trips, approach for climbs, I have bouldered in them!, day hiked up multiple mountains, scrambled, waded streams, wore them through school (rain, snow, ice) and have been working in them for the last year. They are stiff enough for easy climbs, super comfortable, and light. Thank god for the clerk that sold them to me, cause I was reluctant to buy them at first. The soles are becoming worn down now and a small piece of rubber fell out of the side sole, but the abuse they have had I am surprised they have lasted this long. Try them on before you buy them! I am on my second pair in the last 8 months. The problem is that the right boot on both pairs seems to develop a lump or something at the hinge point on the sole at your toes. The first pair it took about six months to develop. I returned this to the vendor I purchased them from and 10-14 days later received a new pair from Asolo. The second pair I just picked up and unfortunately I can feel the same thing occurring after only hours of wearing around the house. I initially loved the original pair and figured it must be just a defect. But when you get the second pair and the same issue. I will probably return these and give them one more chance. The strange thing is that last weekend we did a ten mile hike and I wore my 5 year old run of the mill hiking boots and they felt great. I was starting to wonder if something was wrong with my foot. You can't feel it with your hand but when you put your foot in it you can feel it. Very Comfortable. No break-in period. Stylin'. Lightweight. Very Comfortable. No break-in period. Stylin'. Lightweight. Great stability. Good breathability (for GTX...). Maintained fit over f'ed up terrain (no: gaps, tight spots, blisters). About as durable as a generic Wal-Mart shoe. NOT made in China! YAY!!! These boots were so comfortable, I wore them everywhere for ~3 months. I never even got to go on a serious hike in them! I really wanted to though. If they hadn't $#!- themselves, I bet they would've been great for mountain backpacking. (Lightweight, stable, breathable, waterproof, good traction...) But I wouldn't even consider taking this boot on any extended trip without a tube of Barge Cement. The Fugitives seemed at first to me durable enough, yet horribly underbuilt in places. Maybe a good boot if you aren't 6'5" and 230 lbs, or if you just need a comfortable, waterproof boot for walking around town (and you have some Barge Cement). One last thing. I bought these at REI, and when I went to exchange them for the PowerMatics, I had no problems at all! The process couldn't have been easier - I hobbled in with the old pair and strode out with the new (minus the price difference). REI membership was a great investment! I bought these boots in March 2005 on the recommendation of a friend. I used these boots for work in some really nasty places. They started in the desert, then moved into the city where I wanted the Gore-tex for use in ares with sewer problems. In water, sand, mud, and on hot asphalt these have really held up the past four years. I will admit I was worried at first. For me there was a couple week break in period, but after that, they are by far the most comfortable shoe or boot I own. My big problem with Asolo and all boots are the VIBRAM soles. They might wear like iron, but it's not worth breaking a bone or your neck with. They are so hard they are very slick on any type of rock, wet is worst, but even very small dry rocks a person cannot keep good balance. Initially I loved this boot, no break in time at all and immediately went on a 20 mile trip in the Sierras with no problem. The problems came about later on as the boot began to loosen up from use. It would no longer hold my foot back in the heal and no amount of tightening would correct this. It was well constructed but the material it is made of gets too loose and floppy in fairly short order and the more I used them the worse they got, ended up with black toes from my foot sliding forward and that was it for me. They were just so damn comfortable generally but no good for me in actual use. Thank god for REI and their awesome staff in helping me find another solution to this. I purchased my Asolo Fugitive GTX boots from REI 4 years ago. Since then I've put hundreds of miles on them. From the first step they were the most comfortable boot I'd ever owned. I owe a great deal of credit for that comfort to the REI employee (Brentwood TN). He ultimately fitted me in a shoe approximate 1 full size larger than I normally wear. The Superfeet insoles helped reduce the volume of the larger boot and locked my heel into the heel slot. I've used these boots with heavy to moderate pack loads (30-60 lbs) and unburdened on day hikes. I've worn them on groomed trails and off trail bushwhacking. They always provided enough support and all the comfort I've ever craved. The only complaint I have with my boots is that the composite soles are dangerously slick on wet surfaces. I've slipped into streams and creeks on numerous occasions when I've stepped onto wet stones trying to cross. On one solo day hike I thought I had broken my camera, elbow, and hip when I jumped from one large boulder to another. There was a slight misting rain that day and as soon as my landing foot made contact with the slightly tilted surface it flew out from under me. I landed exceedingly hard on my hip and elbow. After laying there for about 10 minutes I was able to hobble my way back to my car and percocet. My hip still gives me some grief 1 year since. I've never trusted their grip since then. The break in period was moderate and the fit was very good. I wore them a several sections of the AT in N.C and they held up well with a 30# pack. After 9 months of use one of the soles has debonded and is coming off. I've sent them to Dave the Cobbler for repair; he said that he fixes these types of boots all the time. My next boot will be a pair of White Boots with a stitched welt. An extra $100 but a custom fit and fully repairable. The Asolo Fugitive GTX are the boots to buy if you plan an extended trip. Most shoes and boots I wear are size US 11.5 and tend be a little too narrow for my feet, so I purchased size 11.5 wide. The wide size fits my feet perfectly. If you normaly wear a wide and the wide is a little too narrow, purchase a double wide. Breaking in the shoes was almost non existent. I wore them two times walking my dog about 3 miles each time, before strapping on a 50lb pack and hitting the trail for 20 miles over the course of a couple of days. During the hike there was not even an indication of a hot spot or blister. I have worn other types of shoes and boots hiking; some high quality, some cheaply manufactured. The Asolo Fugitive is the best I have worn. I have always gotten blisters after a couple of 10 mile to 15 mile days with other boots, but not with the Asolo Fugitives. In all, over the course of 2 years, I have put about 250 miles on the pair of Asolo Fugitives that I own. About 150 miles of this are on the Appalachian Trail over mountainous and rocky terrain carrying around 50 pounds in my pack. The tread looks like it could handle another 1,000 miles and they still clean up nice enough to wear out on the town! I did not even get blisters when it rained for 4 solid days and my feet were soaking wet. Yes, even though the shoes are Gore-tex and water proof, if you slog through water up to your calves, water gets in your shoes. The only reason these shoes only get 4.5 stars out of 5, is because once they are soaked, inside and out, they take longer than pure leather to dry out. With that said, they are perfect for the hottest days of summer, the the wettest days of spring and in winter down to about 15 degrees F.
In a few years when this pair wears out I will definitely buy another pair. In fact they will probably last so long that I might buy a second pair now - in case they are no longer made in the future! Buy these boots if you want to look like a backpacker. Buy these boots if you want to look like a backpacker. If you really want to use them buy something else! I bought these boots for a 150 mile hiking trip through the mountains in Greece for all the reasons one would want them. I wore them for about two months off and on to break them in and they were great. I should mention that one of my mates that was along on the trip also bought the same pair and was having the exact same problems. So I know that it wasn't just my pair. After the 3rd day on our hike my right foot began to loose feeling, as did my friends the next day. The the tounge on both boots was cutting off the circulation to both feet. I loosened the laces to accommodate. No good, it did not help. The soles of my feet suffered so much after the 5th day that when we reached our first major town, Tripolis, I tossed these boots in the bottom of my ruck and bought a pair of New Balance trail running sneakers. My feet couldn't have been happier for the remaining few weeks of the trip with the running shoes. I am an avid hiker and have done many similar trips on other boots and never had such a problem. We hiked on highways (if you call them that in Greece), dirt trails, and traversed the backcountry the entire time. I tried the boots again several times after purchasing the sneakers to see if they would work again, but they failed me terribly. Don't buy these boots if you are planning an extensive hiking trip! 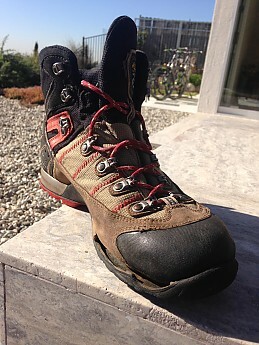 When my wife and I were planning to walk the Camino through Spain in 2006 we went shopping for good hiking boots... being avid walkers, we have had, through the years (both born in 1949) boots from different manufacturers. 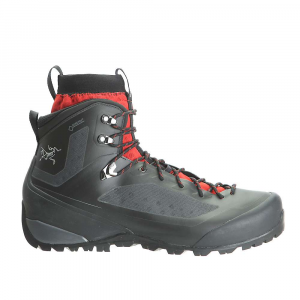 When I spotted the Asolo Fugitive I liked its lightweight and water resistant features. They took me through the Spanish Camino, roughly 800 kms, with a 7-8 kgs pack with great comfort. Had the heels replaced when we got back home. In 2007 they carried me through 1000 kms, with a 7-8 kgs pack, in France. Had the soles & heels done when we got back home. The shoe repair shop has the Vibram brand sole so it come out good. Went into town today and left the boots to be reheeled. The shell of the boot is still in good shape. We live in a small community and we almost always walk with our backpacks with about 5-6 kgs, so we're always ready for our next outing. Someone asked me the other day what kind of mileage I got out of the boots I wore... come to think of it, it's about 1000 kms per pair of heels. I have only one problem with this boot. The fact that I'm getting a few kms on them, I'm looking to get another pair...of 7s... Asolos are hard to find in my neck of the woods... Moncton NB Canada. Like most other reviewers pointed out, these boots need no break-in. I hiked 16 rocky and icy miles in rain/snow the second day I bought the boots. They fit like gloves with no hot spots. Whenever I felt uncomfortable, a little adjustment of the laces always took care of it. They are light (feel like part of my feet) and solidly built (can take a beating). Totally waterproof. Very trustworthy. The only reason I am not giving a 5 star is that the insoles are quite hard. Maybe I should try socks with more cushion. 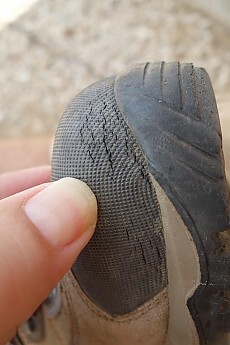 Some reviewers replace the factory insoles with Superfeet. Don't! The ridges under Superfeet grind into the Gore-tex lining and destroy water-proofness. See Superfeet website, Q/A section. These boots are great. There was zero break in time for me, they have never come close to hurting my feet, and are waterproof, warm and have great traction. They are great boots and they perform perfectly. They are really light and you can feel the terrain beneath your feet so there is a much lighter risk of slipping or making misstep. Absolutely love these boots. I have backpacked all over the U.S. and these things have held up great. The Gore-tex truly does keep the water out, and these babies are super comfortable as well. It is well worth spending the extra money to make sure you get a top quality pair of boots. Initially I was going to rate these boots much lower. Initially I was going to rate these boots much lower. I had problems getting the Gore-Tex liner to lay down properly. They were so stiff they felt as if they would never break in. The rubber of the soles was so sticky it couldn’t possibly last more than a few months. Well, it’s a few months, a few hundred miles, and few lessons learned later and I love these boots. I haven’t had any of the reliability or quality issues I’ve read elsewhere here. The stitching has not come apart nor have the soles separated. In fact I’ve found my GTXs to be very rugged. The soles do show some wear, as the rubber really is very sticky, but I believe that’s to be expected. The boots are as stiff and supportive as the day I bought them, even after two weeks on the AT and in Grand Teton toting a 40lbs pack. I’ve owned other boots which have wilted under the punishment of pounding out miles on trails, but not these boots. As for breaking them in, it may have happened more slowly than with other softer leather boots, but they do fit me perfectly now. My feet are medium volume, so if you have medium to narrow feet, I’d say you should absolutely try a pair on. Simply the best boots I have ever owned! I have been at it for over 10 years and have covered some pretty rugged MI, Canadian, and other National Parks. I have about 3.5 years on these and will buy another pair for backup soon. I have a wider toebox and shallow heel and these fit great. My hiking partner also has gotten a pair and he is easily the most picky footwear guy I have ever met (he loves them). They're waterproof, reasonably light, comfortable, and durable. That's that! Despite initial high hopes these boots were a huge disappointment. The stitching came undone at 2 months and the sole separated from the upper in several places. They were also very hot/sweaty boots, probably due to the Gore-tex. So, my experience could be a fluke due to a bad batch, but beware anyway. I've had these boots for over a year now. They fit well and are more than comfortable; they are also durable. My feet are narrow size 12's and this boot is one of the better ones I have found. If you have narrow feet try these. These boots have been excellent for my high arched, narrow heeled foot. Break-in was minimal and they have held up well after a number of trips. Traction is good as is the weatherproofing. They have been an excellent purchase. I love ASOLO boots, this is my third pair and I even talked my dad into a pair. Although I do like the boots a lot, I don't think they break in enough to conform to your feet as much as other boots that I have. They also tend to wear out their soles rather quickly. Break-in Period: I walked about 7-10 miles and then they felt great. These boots are great. The break-in period was very short. I wore them for a week long trip on the AT carrying about 25 lbs. in my pack. The whole trail was covered with several feet of powder so all of the hiking was done with snowshoes. Walking with snowshoes is pretty demanding but my feet were always comfortable. So of my friends started to get blisters but I never did. Not once did my feet hurt at the end of the day. We went through a stream crossing at one point and the shoes remained perfectly dry inside. The only thing is that if I wasn't moving, my feet would start to freeze, but considering that the boots are often described as light hiking boots, I don't think they were intended for freezing weather. Also these boots seem to have exceptional traction. These boots fit my long/narrow foot quite well. I have taken them on winter climbs in waist deep snow with crampons, and on long day climbs. Got a little chilly in the snow, but held up well. Very disappointing product. After ordering two pairs, both arrived w/the Gore-tex lining sewn together under the insole. Both in "wide version" and both on the left foot near the small toe area. Not the quality I had hoped for, spliced together Gore-tex. One repair is approx. 3" long, the other about 1.5". Both can be felt very noticeably through the insole when wearing them. Am waiting for a third and final pair to try. My first and possibly last Asolo products, depending on the quality control of the next pair on the way. Break-in Period: Barely any. Wore them to work a couple times. Just got back from four days and three nights on the Northville-Placid Trail with these babies. It rained the first day so the trail was generally wet and muddy, with a few stream/brook/vlei crossings. They didn't leak a drop. And the previous poster was correct, if they get submerged (mine did), they dry very quickly when worn. Additionally, they support my 40 pound load very comfortably. I did not have one single hot spot or blister with these boots. Although they are classified as light hikers by some places, they can surely be used for moderate week long backpacking trips, which is what I was hoping for. I wanted a boot that I could throw on for a day hike yet wouldn't let me down for a somewhat extended excursion with a heavier load. And these fullfill both perfectly. They must have worked out the hot spot problem that other users have posted. So if you are looking for a good all round boot for multi tasking, these are for you. Did some hiking in PA, WV, and VA with these boots and they are awesome. Kept me feet dry. One thing to keep in mind if they do get wet (aka become submerged) they dry quicker if you wear them, if not they are slow to dry. Other than that an excellent pair of boots!!! Great lightweight hiker! Almost no break-in time needed. Great lightweight hiker! Almost no break-in time needed. I used these to hike up to Half Dome at Yosemite twice. I was carrying a 40 pound pack each time so my feet were a bit sore after each out and back hike but no blisters. I would not recommend using these with moderate to heavy loads but use them for what they are meant for - lightweight hikes. I really like these boots. My feet feal better after a day of hiking then my lower priced Merrells (of course I was not buying the same quality of Merrells...Reactor Mid waterproof). Traction is very good. Break-in Period: About 4 to 5 miles. I never intended to collect hiking boots but I think I do. I seem to find a good reason to have many boots for different purposes. I have managed to find at least one thing wrong with all my boots but I have had these for about a week and cannot find anything wrong with them at all. They feel great during the dayhikes on rough and uneven terrain with a light daypack. I have not taken them out with a heavier pack. I like that they have a fairly stiff sole and soft uppers that molded to my feet. The light weight and slim profile help me forget that I am wearing such a sturdy hiking boot. So far, I can say that they are the most comfortable modern day hikers I have worn. Nothing but problems with multiple pairs. I started with a pair of these boots from REI. The first time on they were very comfortable and I was excited to get such a high quality boot. After purchasing and with a bit more inspection I found that the Gore-tex lining on the heal had a large amount of extra material that caused a crease. This crease dug into my heal and caused blisters on the first day (break-in at the office, no hiking). Obvious flaw. I took that pair back to REI and they ordered another pair. 10 days later I received the new boots and they too had the same issue. Extra Gore-tex causing large creases in the lining. This time on the other boot. Again I traded them in and ordered another pair. 10+ days later a 3rd pair. (Yes, I am getting very frustrated by this point). The 3rd pair had an even larger crease in them near the toe. I figured that maybe I should just wear them for a few weeks to see if this crease would go away. No such luck. 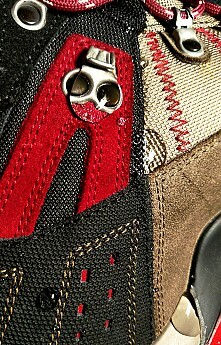 With all the extra Gore-tex material in the lining, it creates large friction points in the boot. I took that pair back to REI again and got a refund. I visited another outdoor store thinking that REI maybe had a bad batch. I purchased the same boot in a different color. The newest pair was very comfortable and didn't seem to have the lining issue. After wearing the latest pair for about two weeks the Gore-tex lining is now releasing from the bottom of the boot. This is actually the second pair that has had this same issue. The lining pulls up and you can feel it "squishing" each step. This is just on one boot. To say the least I have been very disappointed in this boot and in Asolo. I wish they would go back to making their boots in Italy and leave the Bangladesh/China manufacturing to things like computer parts and toys. For what it's worth, I have heard several people praise these boots...I guess that is why I was willing to give them so many attempts. This latest attempt has frustrated me to the point where I will no longer purchase Asolo boots. This is after wearing Asolo's for over 10 years. If you decide to purchase these boots, make sure to inspect the Gore-tex lining closely before leaving the store. I love this boot. Great for snowy days in Boston or in Vail with the Gore-Tex. And comfortable on hot summer days hiking with a light pack. The tongue on this shoe rubs on my right ankle ball...like another user described. This seems like poor design work for a $165 shoe. Had for a month. Runs a little small -- 1/2 size. Had for a month. Runs a little small -- 1/2 size. Heel cup locks you in. Tongue fold rubs my right ankle ball for some reason. It was not love at first wearing for this boot, took a while to break in. Wore them on a 12-miler and haven't regretted buying them since. Finished a hike with a 25lb pack this weekend and they gave great support. Only nit is the Gore-Tex, which I didn't realize made the boot so hot and sweaty on the inside. Next time I will get this boot without GT and will be ecstatic. I haven't been hiking in many years and this boot has been great so far. I went on an 18-mile medium terrian hike and the boot was comfortable throughout, I only had one little blister on my heel. They are very lightweight. Only issue is that they take quite a while to dry unless you keep them on while they're wet then they seem to dry alot quicker, still comfortable when wet. These shoes are awesome! I have severe Plantar Fasciitis in both feet and have spent years trying to find a comfortable shoe for backpacking. I bought them 2 weeks before my 5 day/ 50 mile trip on the Colorado Trail. They were instantly comfortable and the break in period was short. I found that at the end if the day my feet hurt significantly less and were not overly hot. The shoes had great traction on difficult terrain and are easy and fast to lace. I am super happy with my purchase! !